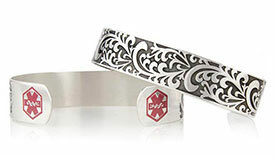 Choose the style you prefer, and we will engrave it with your Alzheimer’s diagnosis and other pertinent information. Alzheimer’s disease is a form of dementia in which nerve cells in the brain gradually lose function. As this happens, a person with Alzheimer’s will experience memory loss and lose other cognitive skills. In the early stages of Alzheimer’s, people experience forgetfulness and confusion. Over time, they might lose the ability to speak and write coherently, make judgments, and solve problems. People with Alzheimer’s might also experience depression, anxiety, social withdrawal, mood swings, distrust in others, stubbornness, irritability, aggressiveness, and changes in sleeping habits. Some people with Alzheimer’s have a tendency to wander and forget where they are. 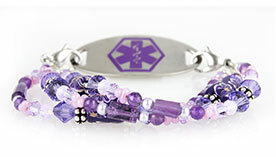 People with Alzheimer’s, other forms of dementia, and others with impaired cognitive function need to wear medical ID jewelry. Alzheimer’s patients sometimes wander and become disoriented to time and place. Without some form of ID, it may take days for them to get back home. Being out of one’s known environment may cause excessive stress, and disorientation could lead to injuries or dangerous situations. Additionally, a person may require medical treatment for his or her Alzheimer’s and any other conditions, which s/he will not get while away from home. If First Responders locate a person, either due to a report of a wandering patient or if they come upon a person on an accident scene, knowing the person’s baseline condition is imperative. If someone is disoriented, unable to recall his or her name, and/or is unsure of the time or place, EMTs may suspect a head trauma or other injury. 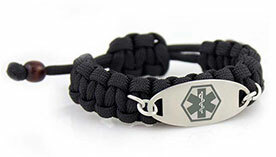 However, something as simple as a medical ID bracelet can let First Responders know that disorientation or memory impairment is typical for a particular person, and it can provide necessary contact information for getting that person back to his or her family or caregivers as soon as possible. 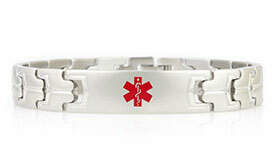 For those with Alzheimer’s, medical ID jewelry should bear the wearer’s name, condition(s), any known allergies, and at least two emergency contact numbers whenever possible. Include an address if space permits, and list current medications if they are consistent.